Our extensive experience has delivered more than 30 large and complex connection projects in the past 15 years, combining innovation and insight to deliver safe, cost effective and reliable solutions. Building on the consultative partnerships we establish with our customers, we have published a suite of documents to provide transparency regarding the connections process. This information supports our commitment to helping connecting parties make informed decisions. We have published the below information in accordance with the Australian Energy Market Commission’s requirements, as set out in the Transmission Connection and Planning Arrangements Rule Change, published 23 May 2017. The following suite of documents provide information on our technical requirements, including our preferred layouts for equipment, the contracts that govern non-regulated connections and our connection enquiry and application fees, and terms and conditions. Our connection enquiry and application fees and the terms and conditions under which they apply. The process of connecting to the electricity transmission network is governed by Chapter 5 of the National Electricity Rules (NER). Fees apply for Powerlink to prepare a response to a connection enquiry, make an offer to connect, and other services. Powerlink’s fees for these services, which are set out below in Table 1, take effect from 1 July 2018. Powerlink reserves the right to review and amend the fees at any time without notice. How we design our network, the components that make up a connection and our preferred layouts. These documents provide a high level overview of Powerlink’s design criteria, including structural and reliability requirements and environmental considerations. Please refer to Network Configuration Document – Selection for New Substations Section 2 and Section 3. Please refer to Transmission Lines High Level Structural Design Criteria Guideline Appendix A. Please refer to Transmission Lines High Level Electrical Design Criteria Guideline Section 3. The typical primary plant is as described in the Equipment Strategies above. Our standard deeds, agreements, and policies for contestable non-regulated connections. We use a suite of three standard form agreements to support the connection of third party connection assets to our network: a Works Coordination Deed, a Connection and Access Agreement and a Network Operating Agreement. For non-contestable connections a modified version of the Connection and Access Agreement will apply. Powerlink has developed a template Access Policy for Large Dedicated Connection Asset Services. This will be published on this website subsequent to obtaining approval of the template position from the Australian Energy Regulator. Environmental and development approvals are site and project specific and depend on the nature, scale, size and location of a project and are determined on a project by project basis. Site/project specific environmental and development approvals information will be provided as part of the connection enquiry/connection application process upon direct enquiry. 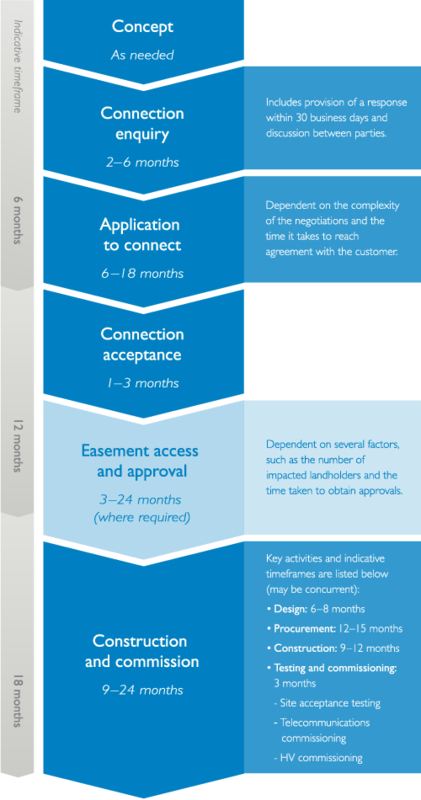 Overview of the potential time it takes for a new connection from the initial connection enquiry to energisation of the connection assets. Routine operation and maintenance scheduling for key plant and equipment. For the substation and transmission line routine operations and maintenance schedules, please refer to the Substation Asset Methodologies Framework Table 3 and the Transmission Line Asset Methodologies Framework Appendix A. Our project delivery model is based on engaging early, and often, to ensure we deliver positive outcomes for landholders, stakeholders, the environment and local communities where our transmission infrastructure is located.